The Centre has reiterated that it would release funds to the tune of Rs 11,000 crore for drought-affected states under the Mahatma Gandhi National Rural Employment Guarantee Act (MGNREGA) within a couple of days. Of the total, around Rs 8,000 crore will be towards pending liabilities. “They came and reiterated their position, this time in an affidavit. So, now they are legally-bound,” Yogendra Yadav, member, National Steering Committee, Swaraj Abhiyan told Down To Earth. The Supreme Court is hearing a petition by the Swaraj Abhiyaan seeking relief for people in the drought-hit states of the country. The case will now be heard next week. 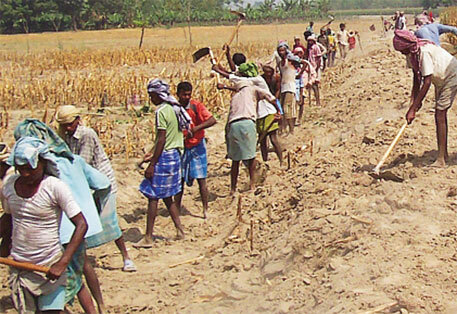 The court directed the Centre to file an affidavit giving details on the quantum and timeline of the money it was going to allocate for MGNREGA. Prashant Bhushan, who is fighting the case for Swaraj Abhiyan, said in the court that the government has to clear dues worth Rs 12,500 crore towards pending liabilities since last year. According to Bhushan, the government should, in fact, be paying Rs 32,000 crore as per rules. Recently, the Centre had said that it would release Rs 7,983 crore towards pending wage liability within a few days. It also promised to release Rs 2,400 crore towards material liability in June. The court also made harsh observations about the Centre’s approach saying it was "non-serious" towards the case. The Additional Solicitor General arrived late for the hearing. “Basically, the non-seriousness of the government vis-a-vis drought and the sophistry on question of MGNREGA were completely exposed today. More than once the judges expressed disapproval of the manner of the Centre in the matter,” Yadav said. He also alleged that the government had squeezed the employment programme dry through non-allocation of sufficient funds. The petition by the Swaraj Abhiyan demands action by the Centre and drought-affected states. It seeks that everyone living in drought-affected areas be granted 5 kg food grain and 2 kg dal per person per month along with 1 litre edible oil per household per month. The petition requests that MGNREGA funds should not be capped and the farmers should get crop loss compensation and restructuring of farm loans along with the measures suggested in the manual for drought management.